Yes, we did! We exceeded the expectations of all at KBIS 2017. Check out our previous post to learn about the success that Fabuwood Cabinetry was and continues to be. Now, for the new stuff. Aside from displaying our current Fabuwood Cabinet Styles, we took the opportunity to introduce some striking lines and colors that we are super excited about. The transitional style of the Galaxy door is what made it the most popular cabinet of the Allure series. The increasing admiration prompted Fabuwood to announce additional colors. 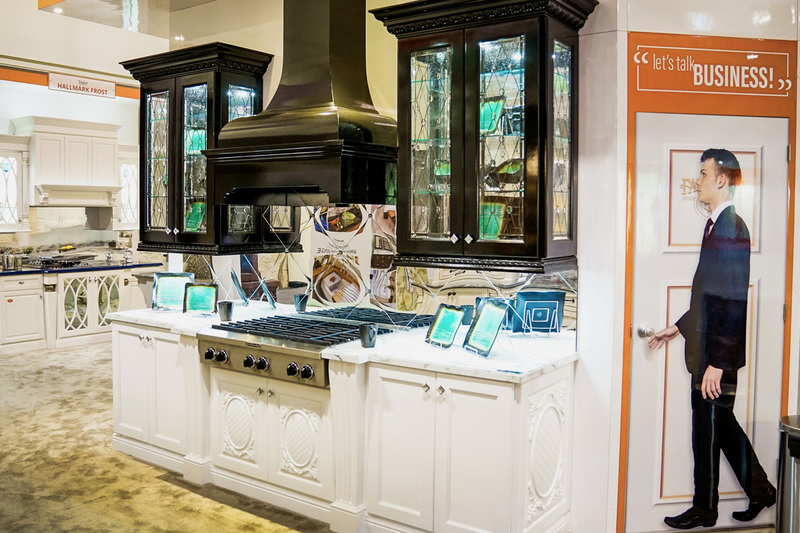 A display at KBIS featured our new colors in a spectacular two-toned kitchen. To achieve a geometric look, custom moldings were used. 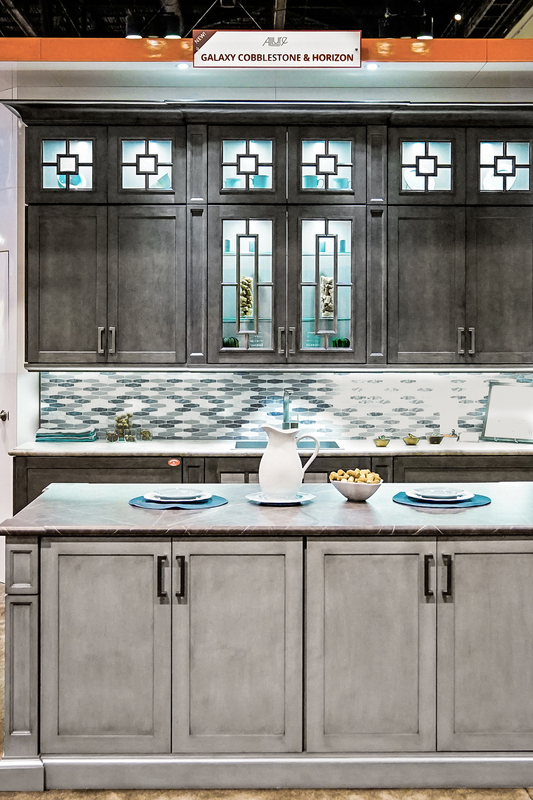 Cobblestone - the darker of the two grays - adds a distinct depth and dimension to the cabinet, while Horizon – the lighter one - draws attention to the clean lines and finish. 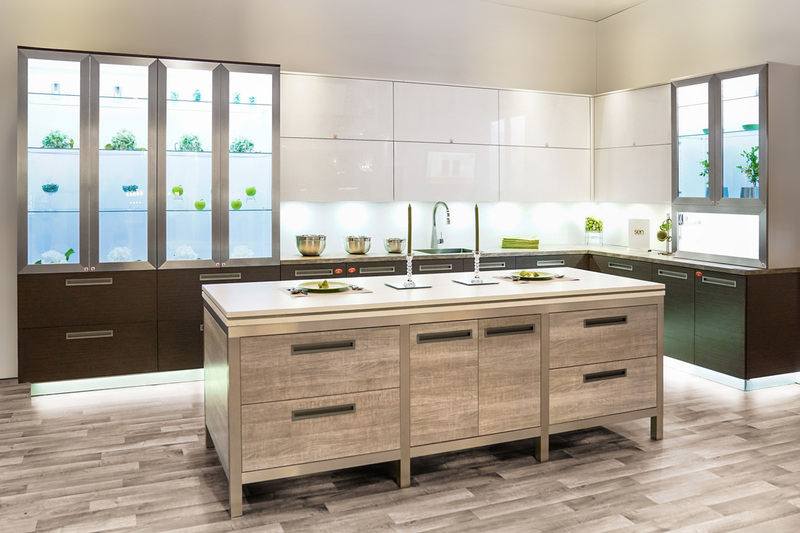 The Illume line is our newest collection featuring simulated wood cabinets in a clean and modern style. We introduced this line in three magnificent colors, each displayed at our KBIS booth. The fun thing about these Fabuwood Cabinets is that they will take on the character of surrounding elements. Using beige countertops and cream paint will create an inviting atmosphere, while choosing white and gray will result in an open and contemporary look. As the lightest of the three cabinets, the Mist isn’t simply a flat tone. Multiple shades and tints form this complex harmony of colors. 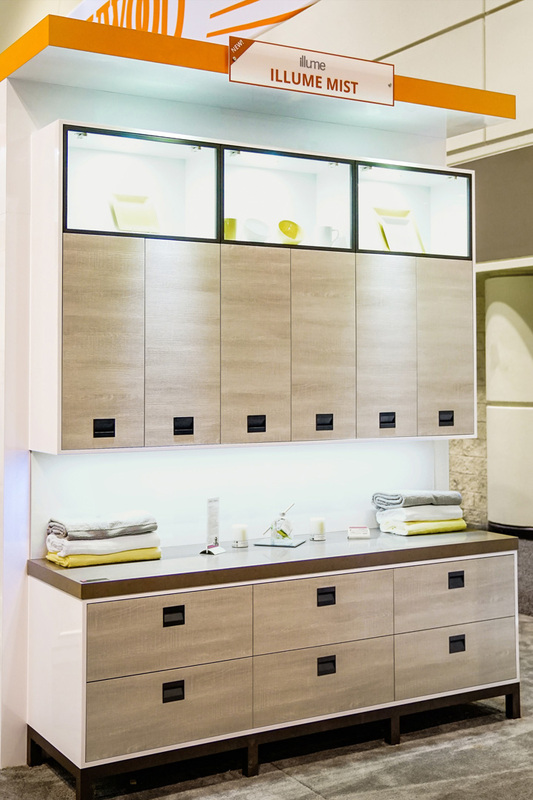 Combining the best in hardware, lighting, and cabinetry resulted in a definite show stopper! Using Blum motorized lift hinges made this already modern kitchen complete for the smart home era. The kitchen was made with the Shadow cabinets. Like its namesake, the Shadow was created by subduing the tones of the Illume line while carrying the beauty of its texture. The island was produced using Luster – the balance of color used in this cabinet brought the entire kitchen together. 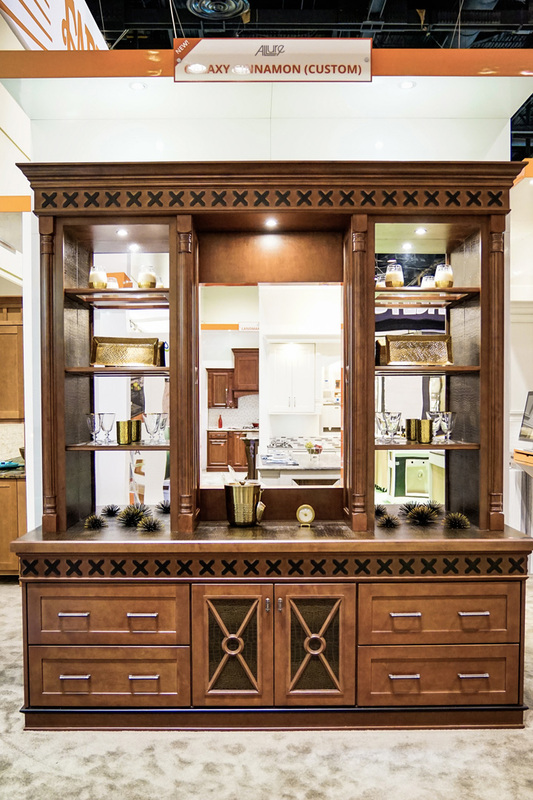 This display is a perfect example of what we can attain using our stock cabinetry. The base of this kitchen is a Fusion cabinet customized with a color and high gloss. At Fabuwood – everything is possible. This kitchen had an absolutely amazing countertop! Partnering with Formica helped us accomplish what other haven’t. This beautiful leather countertop says it all. Our Hallmark Pecan kitchen demonstrated the adaptability of our products. 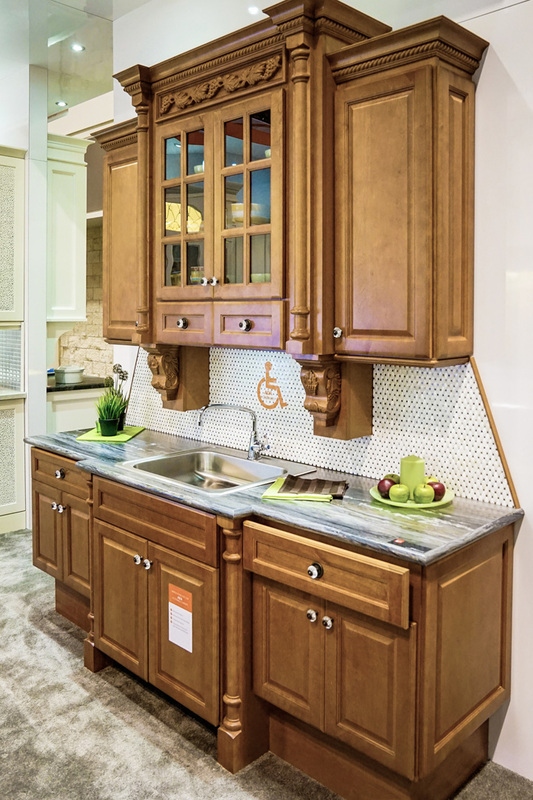 Equipped with low counters and removable cabinets, the ADA kitchen was designed to ease the burden of the disabled. One last shout-out to all who stopped by to see our booth – it was great getting to know each and every one of you. Can’t wait to see you back here for more from The Makers of all things Beautiful!